The Submission Works sales page claims it to be revolutionary software with $77,000 investment in the development. First warning signs are the sales page, a typically a long story telling format, taking you on the journey with creator Brandon Wheeler to his sudden breakthrough, which ends with him designing this amazing software and turning down offers from Google, Yahoo etc. Too much hype instantly makes me skeptical. First concern here would be saturation – what happens if too many people submit the same link? This is addressed through the availability of a ‘saturation checker’. You add your link to it, and it tells you if there are slots available for that url. 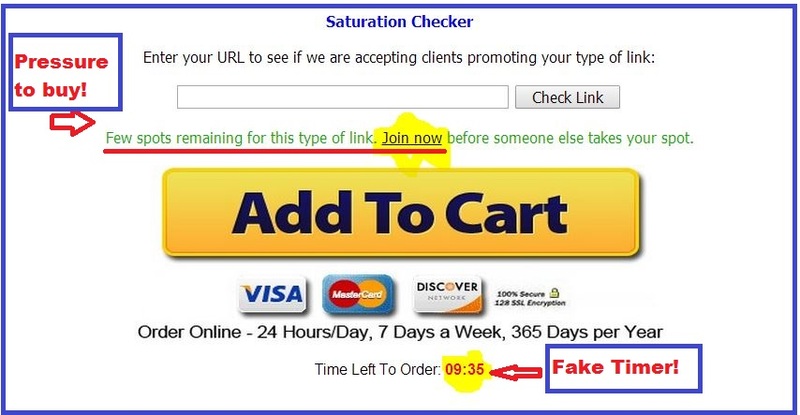 But this seems a bit fishy – I have checked some popular internet marketing forums like the warrior forum, and it seems that no one has actually had a negative result on the saturation checker – it always says limited slots available! Read on to see my actual results. I decided to do test and see for myself if this actually works. I singed up for membership easily. Once inside it is pretty straight forward, I added my seven links and tracked their results. I added a mixture of Clickbank links with know high conversions, some email capture and other links to make sure I had wide spread in my test. On the first day I saw some hits coming to my sites. This increased slightly over the next couple of weeks. But the bottom line is that I received no sales or subscriptions. In, fact, my link tracker recorded no actions at all – in other words, not even a click on the page for more information like the FAQ page. The uniqueness of the hits was between 75-80%, which is reasonable. But in this case the curious part was the source of my traffic. So what does this mean? This looks pretty much like a exit pop-up bulk traffic purchase. Nothing like the supposed $77,000 software development. Exit pop-ups have been around for many years, and they do not produce results. There is no free trial for you to test or at least see what the members area looks like. Submission Works is definitely a scam, based on the over hyped sales page, fake timers and the fact their ‘software’ probably does not exist. If you really want to earn online or have success in affiliate marketing, I recommend you start by testing the waters by setting up a free website. Next I would recommend that you look at the free affiliate training available here. You will never need to to fall for another traffic scam again. How to cancel submission works? It is relatively easy to cancel your subcription, juts make sure you follow though with the steps. Next you will receive a reply from support, asking if they can help you with anything before they cancel your account. It will sate that you have to reply to the ticket to confirm cancellation of your account. Make sure that you reply to that message and confirm that want to cancel the account! Are you a former user? Do you have any Submission Works complaints? Or do you disagree with my review? I tried them for a month, plugged different well selling from clickbank plus my Empower Network affiliate link, and….nada, zero, nothing happened, no sales, no subscribers. And I did get once, after using saturation checker, a message saying I can’t use that link at the moment, that was link for Empower Network. Getting a refund was quite easy, I asked and they gave me my money back. Not surprised with that result, it appears that the Empower Network affiliates posting positive reviews on Warrior Forum had their accounts removed due to suspicious activity.